I had a second wisdom tooth out on Saturday — bottom left, the counterpoint for the top left which I had extracted back in 1998. The dentist had said it was best it came out now. It was moving upwards anyway, due to no pressure from the top left one. Worse, cleaning around it was becoming an issue, so I risked damage to the next (more useful) tooth along. This time, no particular issues — once again I tried to concentrate on other things as two needles went in, then various equipment (I dunno — grappling hooks, pliers, that kind of thing) until the tooth was yanked out. This time no stitches. In the past I’ve been unconvinced by the benefits of electric toothbrushes. They just seemed like a gimmick to me. That was until at a checkup last month when the dentist noted that the kids might well find them better, to counter less-than-perfect manual brushing. He recommended the Oral B brand specifically (interesting since the “show bags” from there generally include Colgate stuff). 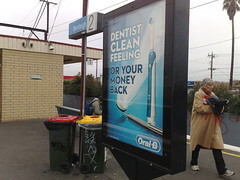 Perhaps coincidentally Oral B currently has an advertising campaign for its electric toothbrushes. So I picked up a couple of electric toothbrushes for the kids. I wasn’t going to bother for me, since my manual toothbrush is new, and I think my technique is reasonably sound; I just don’t floss as often as the dentist would like — but does anybody? But then by chance I found a third electric toothbrush, still sealed in its wrapping, in my bathroom cabinet. I don’t actually know how it got there, but I have a feeling I might have bought it for my dad a couple of years ago, who then he decided he didn’t want it. The main change is the brushing style. 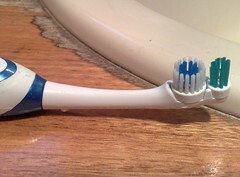 Obviously the toothbrush itself does the round-and-round brushing motion itself, so there’s no need to do that manually. In fact, emulating the dentist, and going slowly around your mouth, from the tip to gum of each tooth, spending 30ish seconds on each quarter of your mouth (top/outside, top/inside, bottom/outside, bottom/inside) seems to be the way to do it. No matter what the technology, technique counts for a lot, so we’ll still have to make sure everybody’s brushing effectively, even if the toothbrush is doing more of the work. What’s everybody else use? What’s your dentist say?